Our mission is to promote and foster our community assets, including a proud history, diverse business community, wondrous natural environment, vibrant cultural arts scene, dynamic education systems and top-quality healthcare services. Our Vision is to enhance and promote a strong and vibrant business environment and an unparalleled quality of life. The Chamber hosts an annual dinner event each January with approximately 200 in attendance. The event is held at the J.E. Broyhill Civic Center. The L.A Dysart citizenship award is given to the man and woman of the year at this event. 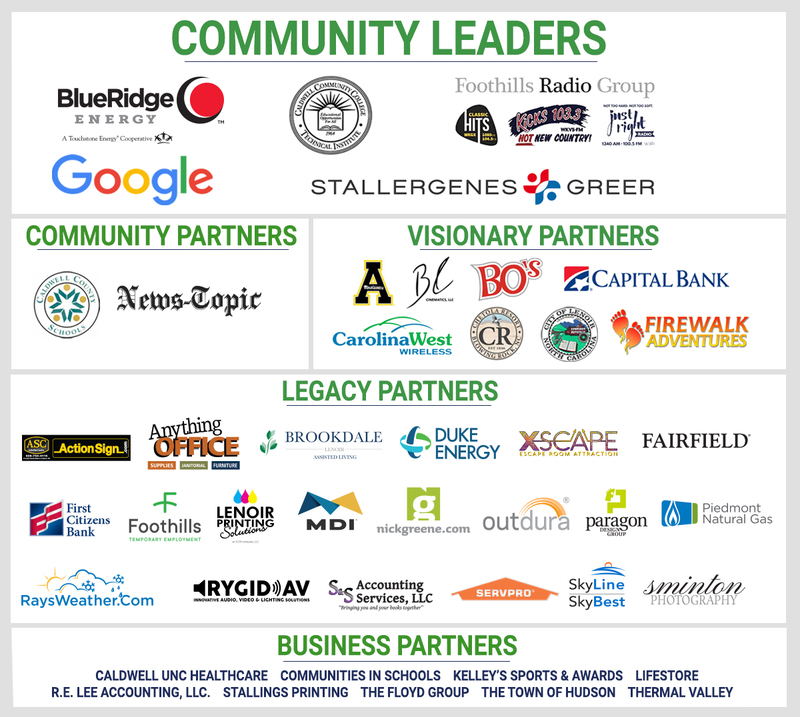 Since 1993 the Caldwell Chamber has annual hosted a Leadership Caldwell program. This thirteen-week program is designed to - build and enhance leadership skills; provide inside and personal interaction with Caldwell County’s government, human services program, education systems, tourism, industry, economic development, quality of life; and much more. Up to twenty adult students attend the one-full day per week program. The program ends with a luncheon graduation ceremony where members of the Chamber and community leadership join the students in celebration. 2015 marked this 14th annual festival planned and organized by the Chamber in partnership with the City of Lenoir. The event drew 15,000-plus attendees and 200 vendors to downtown Lenoir. The event includes all the general festival activities – music; children’s activities; food, craft, and others types of vendors, . . . In addition, there is an eating competition; the World’s Largest Patchwork of Blackberry Cobbler – and parade; recipe contest; Little Miss Blackberry Princess pageant; Parking Lot Pickin’ competition; farmers/berry market; and American Red Cross blood drive. Annually, the Chamber hosts a luncheon event to recognize outstanding business leaders. Approximately 100 people attend. Awards are presented for Small Business of the Year, the Blue Ridge Electric Service Star and Service Excellence Awards. The Chamber conducts one-on-one recorded TV interviews recorded by the Caldwell County Public Information Department and broadcast over the Charter government station as well as on YouTube. In an effort to raise awareness about the diversity of the Caldwell County manufacturing sector of the community, the Chamber solicits samples of locally produced items for exhibit. The 2015 exhibit Was on display in the Caldwell Chamber and Visitor Information Center from mid-October through mid-November. The Chamber hosts quarterly Business After Hours’ events each year. They are sponsored by members and held at the member’s place of business. Attendance generally ranges between 35 and 60. The Chamber plans and hosts these information sessions to provide important business information to the membership. The events are generally offered each quarter and are held at the Commission Meeting Room in the Caldwell County Offices. Attendance is approximately 30 to 40 people.. The Chamber provides ribbon cutting events for both members and non-members who want to introduce something new, renovated, or even want to celebrate a milestone business achievement or anniversary. The event is at the member’s place of business and attendance varies from 20 to 30 people.